There are some of us that do this as part of a slow food / living simply / homesteading type thing. With homemade pasta, you don't need any preservatives, and have complete control over what ingredients (quality, variety) are used. You can add elements for a specific flavor (spinach is common, beet is something I'd like to try, I could see basil, and now @lemontwist has me curious about squash...), or substitute ingredients for specific dietary or health reasons. I know several people who make their own pasta so they can make sure no salt is involved. Fresh pasta is easier to cook, and doesn't require additional pantry space. You likely have all the ingredients on-hand. Cheaper, customizable flavor (spinach, tomato, squash, etc), and in my opinion, far more delicious (ie fresh, different mouthfeel, and also because you control the ingredients you can use your favorite spices or veggies) than store bought. Only downside is the effort. It's better for sure, it tastes great and you can choose better raw ingredients and quality flour. 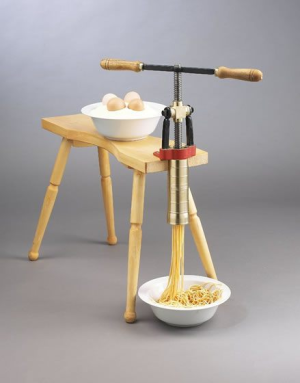 Moreover you can add veggies, spices, eggs and customize pasta in many ways. You can also choose the best shape that suits your condiments. What Old World Europe countries (apart from Germany and Italy) have their own unique pasta traditions?